When I make my timetable for the semester, I try to have an hour break between long blocks of classes so I can give my brain a rest. While this is all good for the first 10 minutes, most of the time I find myself in the library falling asleep over my notes desperately wishing I’d brought my laptop to trawl Facebook for some goss and daily lols. Boredom has struck! I used to think I’d be busy 24/7 with uni work (I should really get into doing the weekly readings) but now I’m just bored. 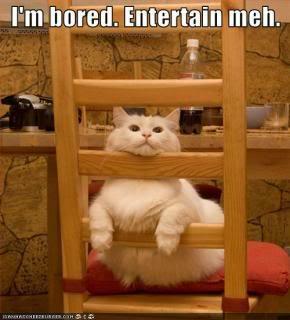 Chairman of the Bored. However, I’ve come up with a few things to stop that boredom bug from biting again!